Other Books From Author: Next Fall we'll get book #2 of this series, Poisonfeather. The Short Drop is a mystery/political thriller. My grandpa loved this genre and when I was little I just read everything I could lay my eyes on. That's when I started reading these intense action crime thrillers. I haven't read anything like it for a long time, but I was positively impressed throughout the whole book. I wasn't expecting to love it as much as I did. First things first, let's dive into the plot summary. A decade ago, fourteen-year-old Suzanne Lombard, the daughter of Benjamin Lombard—then a senator, now a powerful vice president running for the presidency—disappeared in the most sensational missing-person case in the nation’s history. Still unsolved, the mystery remains a national obsession.For legendary hacker and marine Gibson Vaughn, the case is personal—Suzanne Lombard had been like a sister to him. On the tenth anniversary of her disappearance, the former head of Benjamin Lombard’s security asks for Gibson’s help in a covert investigation of the case, with new evidence in hand.Haunted by tragic memories, he jumps at the chance to uncover what happened all those years ago. Using his military and technical prowess, he soon discovers multiple conspiracies surrounding the Lombard family—and he encounters powerful, ruthless political players who will do anything to silence him and his team. With new information surfacing that could threaten Lombard’s bid for the presidency, Gibson must stay one step ahead as he navigates a dangerous web to get to the truth. Okay, these were my reactions after turning every page. It was either WHAT THE HELL IS GOING ON or OMG I DIDN'T EXPECT THAT. Do you know what I mean? Mind-blowing I tell you. Matthew FitzSimmons's debut novel is phenomenal. It crosses many genre: psycho, thriller, mystery, techno, political and action crime. The book is an intense page-turner packed with suspense and wit. I was hooked from the beginning, but the best part starts about 100 pages after. It's hard to believe it was a debut novel. The plot was so well thought and I just couldn't figure it out. That's when you know a mystery book is good. I usually predict the culprit and the likely ending towards or just after half of the book. This time was different. I understood who was involved in everything, but I didn't know HOW and WHY. Mind-blowing and sick. There was a great variety of characters and I liked that, it made the story more interesting. I personally loved Gibson Vaughn. He is a computer hacker in search of a childhood friend. You could feel his pain and need to find her, you just knew that connection between them was so pure. Her disappearance has hunted him since he was a troubled teenager and now he wants to find the truth. Now, he is 28 and a total mess. Gibson Vaughn is a complicated and flawed hero. While reading I could feel a connection with him, the readers are the audience of this story and they're looking it from behind Gibson's shoulders. We were his readers's army. The other characters I was fond of were Jenn Charles and Hendricks, the two "agents" who recruited Gibson for ACG in order to solve the mystery and discover Suzanne's fate. Jenn Charles at first gave the impression of being an unpleasant woman with a bad disposition. I was glad I was proved wrong, really glad. She is is put off at first by Gibson's hostile demeanor (wait I thought she was the hostile one). But she soon gives in to his “rough-around-the-edges charm” and pale green eyes, and so will plenty of readers, me included.Hendricks was the strong personality of the group, the "go-and-get-it" one. He was the hard one, but I knew deep down he had a good heart. Other two characters I felt a deep connection with were Suzanne and WR8TH. Suzanne was a sweet character from the beginning. We only know her through other people's perspectives, but we always get the same feeling. At first we are pushed to think of her as a rebellious teenager, but we are given many different choices after that. She was an avid reader and manages to communicate with everyone involved thanks to a book of hers. (I would love to say more about it but I don't really spoil it for anyone else. I think the best part when reading a book like this is figuring it all out by ourselves. So I won't say anything more.) After we know what happened to her, at the very end of the story, I am sure you will mind-blown. Told you it was a mind-blowing book. WR8TH was a character we weren't supposed to like during the first half of the book. BUT. Things change and we actually discover he is one of the good ones. I can't say anything else ugh Anyway, I really loved him and I wanted him to have a proper ending. I sure hope it didn't end how we were supposed to guess in the book. The two "evil" characters were Calista and the professional killer hired to kill all of them. Their presence was necessary and, even though I didn't like them as human beings, I thoroughly enjoyed how they were involved. What they were doing was sick and I don't even know how to describe it. Just read the book. The writing was impeccable. I was drawn to the story and the author just made me want to turn the pages, I couldn't put the book down. In fact, I just read it one sitting if we don't count the 68 pages I had read the day before. I personally found it compelling from the beginning. I usually don't enjoy when the villains are all-seeing and all-knowing, but thanks to FitzSimmons's ability in storytelling this time it didn't bothered me one bit. You don't know who to trust and your head is spinning with possibilities about where the plot could go. And I was of course an enthusiast of all of this. The main themes I found recurring during the story, besides the principal plot line, were politics and Information Technology. Both were intriguing and added that special feeling to the book. I personally loved to read more of the second one, it is a subject I am very interested about. All the descriptions and little details were very well-written and well-thought. Everything was plausible and realistic. I am not very fond of political matters, but we get to see a small part of it and all the intrigues and tricks used in this kind of situation. It can be complex, but I enjoyed reading about it. 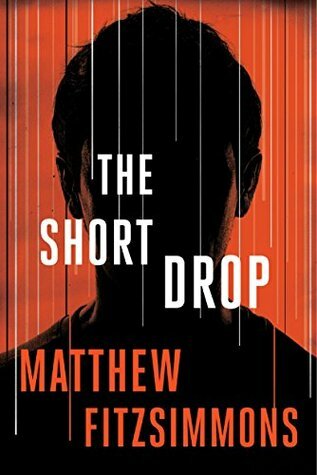 The Short Drop was an amazing read and I HIGHLY recommend it, I can't say it enough. “The Short Drop” may not be an attention-grabbing title. But when I came upon what that phrase means, I nearly jumped out of my chair. Stand forewarned. Also, I cannot wait for the next book, and more from Gibson. Stay tuned for the second book in this exciting new series, coming Fall 2016. Poisonfeather (The Gibson Vaughn Series Book 2). NOTE. I received a copy of this book for free from NetGalley in exchange of an honest review. All opinions are my own.